With so many different piano types out there, it’s easy to get bogged down with looks, sizes, abilities, and sounds. In a nutshell, though, a piano will always be a “keyboard musical instrument with a wooden case enclosing a soundboard and metal strings, which are struck by hammers when the keys are depressed.” (Thanks Google). As you may know, our modern piano is technically the “piano-forte,” but you’ll have to check out our history of the piano post next week to get more info on that. Start getting excited. So without further ado, here is a guide to the different piano types—the tall ones, the skinny ones, the short ones, and the fat ones. Oh, and the electric ones too. You might even use this as a “piano buying guide,” since we’ve compiled a good bit of pricing info to help you out. Without dipping into the history too much, here’s the gist: the grand piano, as we know it, appeared on the scene around the year 1700, courtesy of Cristofori. Since then, we have seen a number of variations and changes, and you can basically take your pick regarding size and capabilities. Because we musicians like to box huge ranges of subject matter into neat little boxes, we’ve organized the variations of the Grand Piano into three general categories: Concert Grand, Parlor Grand, and Baby Grand categories. 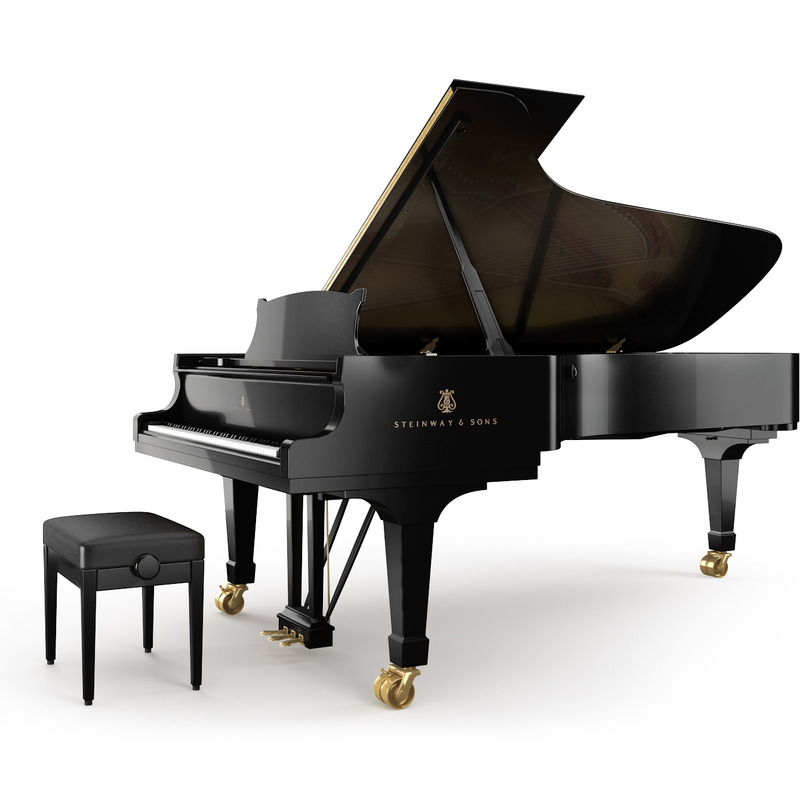 With a typical length ranging from 7-10 ft, the Concert Grand piano is the largest of the bunch. It’s the piano you see in Carnegie Hall, university concert stages, and most professional venues around the world. While a bigger type of piano doesn’t necessarily mean a better one (we’ve all played on a concert grand that is untamable or simply too loud) concert grands have the largest and most resonant sound of the piano family. That’s why a concert hall or large room will need a concert grand. The concert grand has longer strings than other pianos, and that extra length and stiffness (plus a significantly lower inharmonicity) is what gives the concert grand its superior sound. For obvious reasons, these pianos sit at the top of the monetary food chain. We found a used “Victor Borge” Pedigree Bosendorfer Model 275 concert grand piano for under $50,000, but these types of pianos would probably retail between $130,000 and $170,000. The manufacturer’s price sits at $210,000. A Steinway and Sons Model D concert grand will run you close to $150,000, and if you have $175,000 to burn, you can own a brand new 9 ft. concert grand from Yamaha. Safe to say that depending on the size concert grand you want, you’ll spend between $120,000 and $200,000 for a new piano. If price is no object, you can spend significantly more (check out the Bosendorfer Porsche model for a truly transcendent retail price!). If cost matters, then ask your local retailer for used options. There are many! The “Parlor Grand” is the middle ground of grand pianos, and we would typically refer to these simply as a “grand.” They come between six and seven feet, so they are suitable for large rooms in a home, moderate rehearsal spaces, and even a recital hall that isn’t too big. A well-made grand piano features the wonderful combination of a resonant sound (albeit not quite as large a sound as the concert grand), a large-but-not-overwhelming size, and a degree of playability that some concert grands lack. In other words, the moderately sized grands capture many of the benefits of the concert grand, but they are easier to play than the huge pianos. Touch, tone, and dynamic range are easier to control on a 6-7 ft. piano. How much does a grand piano cost? Regardless of the piano types, you have to take the manufacturer price with a grain of salt; they set the price at a certain threshold so that individual retailers can maneuver below. In this instance, you would find that the manufacturer price for a Steinway Model B is set around $95,000. Depending on the retailer, you may be able to purchase that same piano for significantly less. If you’d like a snapshot to give you a brief overview, here’s a quick brand break-down of five popular brands and the average price for a new 6-7 foot grand. Towards the end of the 19th century Americans trended towards a greater appreciation of music, and they invested in learning to play and in musical instruments. The invention of the phonograph towards the end of the 19th century certainly helped—now more households could listen to music than at any other time in history—and the American population enjoyed more wealth than in previous eras. With the other different piano types either too large or too expensive for regular folks in need of an instrument, Hugo Sohmer invented the Baby Grand in 1884 (Hugo Sohmer was the founder of Sohmer and Co.). This 5-6 ft. version of the grand piano, with a smaller but still mellow sound, has been a popular addition to the piano lineup ever since. If you want a Steinway baby grand, you’ll have to part with at least $50,000. Certain models (namely the Macassar ebony finish) range all the way up to $99,000. Baldwin baby grands are wonderful pianos in their own right and range from $22,000-$35,000, and Yamaha, with an entry level offering at $34,000, is a reliable choice as well. We understand the urge to check used listings, but don’t forget that pianos depreciate slowly (a good thing if you own one). If you look for a used one, don’t be alarmed by the fact that the price isn’t too much lower! If you’re a music student at a university, or you had a music teacher in elementary school or high school, you probably know all about the upright piano. The vertical string alignment makes an upright piano much more compact than a grand, and the sound of the instrument doesn’t even have to suffer all that much—although upright pianos have a higher likelihood of producing a “twangy” sound. Bar room piano, anyone? An upright piano that approaches 50 inches in height will often be referred to as a “professional” upright piano. Some professional uprights even have the same string length as a grand, and therefore their sound is relatively similar to that of a grand’s. You’ve probably used a “studio upright” in a practice or warm-up room somewhere—they start at 43”. If you need something smaller, the “console uprights” will be less than 43” tall. The “Spinet” is next in line for upright types of pianos, but you won’t see many of them: they aren’t made anymore. In all honesty, it’s just not a good option for anybody, unless you’re looking for a nice piece of furniture. The one benefit of this type of piano is its size, since it reaches between 36 and 40 inches high and only 57.5 inches wide. Some people may argue that it’s a good beginning instrument because the price won’t put you in a financial hole, and that’s true. Unfortunately, you get what you pay for. And low price, in this case, does mean low quality, which is why they were invented – to provide an affordable acoustic piano type. The “drop action” style is very different from that of a grand piano, and it doesn’t yield the same dynamic control. Yamaha and Steinway are two of the most popular upright brands (as they are for many other pianos too), but they are popular for different reasons. You can find a Yamaha upright piano for around $4,500 (they go up to about $19,000), and entry-level Steinway uprights start at $25,600. Baldwin uprights play reliably and hover around $9,000—for more prices, check out the Piano Blue Book. Many parents like to start beginners on an electric piano for a simple reason: electric keyboards are cheaper. Fortunately, that doesn’t mean they have to feel and sound “fake.” Many brands have produced electric keyboards that mimic the sound and feel of real pianos, and even advanced piano players can enjoy electric pianos now, thanks to improvement in the technology. If you are looking at electric pianos, consider two main factors: number of keys and action. If you perform in popular genres, several other factors will be important to you as well. Number of keys is especially important for young pianists, because it is during the formative years that a pianist will become familiar with the distance, feel, and “topography” of the keyboard. A student who learns on a small keyboard may not adjust well to having all 88 keys in front of him when he uses his first full size keyboard, and he might get used to using only the middle 2-3 octaves of the piano. That habit is hard to break! The action of the keys refers to the way the key feels when you press it down. Many modern electric pianos even imitate the slight “hitch” one feels when the hammer first contacts the string on a grand piano—the closer an electric keyboard feels to a grand piano, the better. Pianists who don’t experience the feel of a genuine piano may have difficulty in playing the full dynamic range of the piano, and they may not develop proper finger strength in the first couple of years. Curious minds might appreciate one of Yamaha’s cool new inventions—a “hybrid” piano that features grand piano sound, style, and feel, but produces the sound electronically. Even the New York Times wrote about one of these electric pianos. One great source for finding electric piano prices is pianobuyer.com. You can easily choose from features such as the finish color, string resonance, and number of voices (ranging from 8 to about 250), and you are likely to see a range from $500 to roughly $20,000. As the prices go up, you can assume that the sound and key action will improve. In short, you get what you pay for with pianos—but, as in the case of Steinway and Sons, you may end up paying substantially more for a brand name. If you can afford a Steinway, you should definitely go for it, but if not, “lesser brands” like Mason & Hamlin, Baldwin, and Yamaha make some magnificent instruments too. One of my favorite pianos of all time was a Yamaha, in fact. When it comes to electric piano types, don’t forget that key action, sound, and number of keys will heavily influence your child’s development as a pianist, so don’t short-change them on the instrument they use. If you are an older amateur who just wants to have some fun, there are many portable keyboard models out there that won’t cost an arm and a leg. And lastly, remember that the suggested retail prices you find from manufacturers of all piano types are ridiculously high. Vendors almost always sell for a substantially lower price! Adam Gingery is a freelance copywriter and journalist who double-majored with piano pedagogy and euphonium during undergrad before pursuing performance in graduate school. He is a former runner-up for the US Army Band National Collegiate Solo Contest and silver medalist at the Young Texas Artists competition. He is a general contributor to the Musika Blog. I have a Yamaha uptight piano, in excellent condition. I’d like to sell it, but I don’t know what price to ask. Can you give me a price range? Thank you very much. Hello Nancy! We’re actually not in the business of appraising pianos. However if you are able to find the model type of the piano, a quick Google search should yield results as to how much they are selling for. All the best!